*For Single Mode Use* Unmanaged 4 Port Industrial 10/100BaseT Ethernet to Fiber Optics 100BaseFX Converter that secures data transmission by using fiber optic transmission to provide immunity from EMI/RFI interference. (SC Connector; Single-mode). Comparable to Sixnet, Stride, Hirschmann, and other industrial Ethernet Switches. Supports operating temperatures from 0°C ~ +70°C (32F ~ 158F). The NS-205F/NSM-205F is a 4-port unmanaged Ethernet with 1 fiber port switch. Using fiber optics, you can prevent noise from interfering with your system and supports high-speed (100 Mbps) and high-distance (up to 15 km) transmissions. 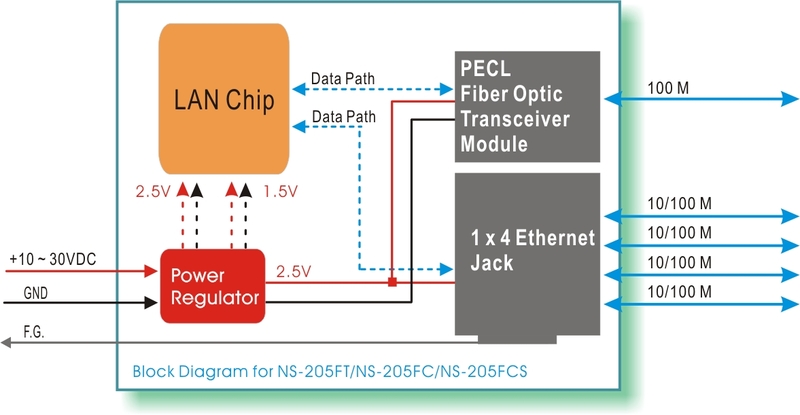 The NS-205F/NSM-205F provides a wide 10 to 30 VDC power range to fit all the common power standards found in industrial automation, without external power converters. The wide power input lowers installation and maintenance costs.